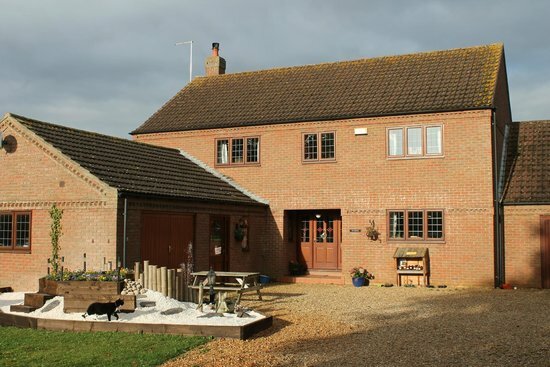 Tilney St Lawrence Vicarage B&B is situated in the quiet, rural Fenland area of West Norfolk. The B&B is 7 miles from Kings Lynn Town Centre and 7 miles from Wisbech Town Centre. The B&B has both a twin and double room available to book. Please note that the rooms are not interconnected. Tilney Vicarage B&B rooms have Television, Wi-Fi, bathrobes, hair drying facilities, tea/coffee making facilities. Rooms do not have their own bathrooms – the bathroom is shared between the two rooms. The shared bathroom is a deluxe roll-top Victorian bath and has a separate shower. The Vicarage also has a Jacuzzi in the extensive garden. The garden is fully enclosed and not overlooked, offering guests complete privacy. There is also a children’s play area so that little ones are able to run around whilst their parents relax in the Jacuzzi. The Vicarage B&B is pet-friendly – dogs are welcome, provided that they are well behaved. The proprietors, Maddy and Martin have ducks, chickens, sheep, a cat and a dog!